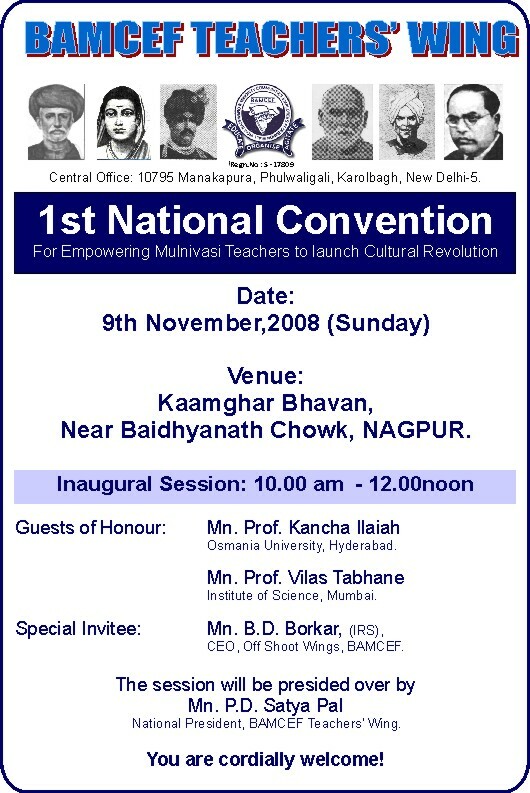 We are delighted to bring you news that BAMCEF Teachers’ Wing has organised its 1st National Convention on 9th November 2008 at Kamgar Bhavan, Near Baidyanath Chowk, Nagpur, India. Renowned Prof. Kancha Ilaiah of Osmania University, Hyderabad and Prof Vilas Tabhane, Institute of Science, Mumbai shall be guests of honor and Mr. B. D. Borkar, CEO, Offshoot Wings of BAMCEF will be special invitee. Dr. P. D. Satyapal shall preside over the inauguration session. The topic for the open awakening session is – ‘Can the present educational policy of India bring about the Constitutional objectives of Equality and Social Justice?’ Dr. Vivek Kumar (Asst. Professor at JNU, New Delhi), Prof. Ilangovan (Wooris College Vellore, Tamilnadu), and Prof. Munish Kumar (Gorakhpur University, U.P.) will put their views on this topic. Mr. M. T. Sao the president of BAMCEF Teachers’ Wing, Maharashtra will preside over the 1st delegate session and Prof. P. D. Satyapal shall preside over the open awakening session. Please click here to download pamphlet for detail information. This year BAMCEF is holding its 25th (Silver Jubilee) National Convention. From the beginning BAMCEF had dedicated itself to the goal of social change, which our emancipator had laid down. Over the past three decades we had concentrated specifically on two aspects i.e. first, awakening the society on the issue concerning our condition – thereby exposing the conspiracy of Brahmanical System and second trying to organize all caste components who are the sufferers of social system. On both the fronts BAMCEF had succeeded to the extent that the power structure and Brahminism forces have acknowledged our existence as a pressure group of Phule-Ambedkarite movement. BAMCEF salutes the dedication, sacrifice and efforts of all its activists who had toiled to achieve this level. With this achievement one can certainly say that BAMCEF is going ahead in a right manner towards its pre defined objective. Our impact on the power structure had compelled the Brahmanical forces to redesign their strategies so as to keep control over the social system. On the other hand BAMCEF had succeeded in motivating various caste components of Mulnivasi Bahujan Samaj to release themselves from the grip of Brahmanical forces. Such process of action and counter action is bound to continue in more severe form in the days to come. To cope up with the changing situation we need to indentify and incorporate stronger inputs to design the strategies to combat Brahminism. While trying to achieve the objective of social change, on one hand we had been exposing the conspiracies of Brahminical forces to awaken the masses and on the other trying to unite different caste components of 85% Mulnivasi Bahujan Samaj. Our experience of past three decade revealed that the identity crisis is a major lacuna in keeping the Mulnivasi Bahujan Samaj united. Hence to forge the homogenous unity amongst different castes we had rejuvenated Mulnivasi identity. Accepting the common identity can only be the means to march in the direction of achieving the objective of social change. Having made definite dent of Mulniwasi identity in the society, our enemy has also felt its impact to the extent that their identity and presence in this country has come under scrutiny. It can be seen that in post Ambedkarite era, nobody had laid emphasis on building and strengthening the movement. All the Phule-Ambedkarite organizations which emerged were mainly out of reactive response. The speed with which society responded to the reactive issues had also calmed down with equal speed. Such response could not build the organization and unity in the society. Building the movement with such response will remain only a wishful thinking. On the other hand movement building process is very slow and the result cannot be seen immediately. Only its presence and impact can be felt, on power structure which can be observed in the society. Over past three decade BAMCEF has succeeded in training the human resources, dedicating and committing them towards the objective of social change and building the movement. BAMCEF had never diverted or diluted this objective. In the light of this background and on the eve of 25th National Convention, the activists of BAMCEF will be reaffirming its commitment in further strengthening Phule-Ambedkarite movement. We look forward for awakened response from the society. The objective of social change is not small and simple. It was more difficult during the time our emancipators, who had led the movement. Their efforts, to the larger extent, had softened the constraints, which had spoilt the social system. But the challenges which are prevalent today, needs to be dealt with more determination and dedication. The situation becomes still more challenging because the counter revolutionary forces in the society are continuously watching our move and re-designing their strategies. The task therefore, in front of us is twofold: first to strive for achieving the objective of social change and second to understand the motives and moves of counter revolutionary forces operating in the system. To handle both the tasks successfully one need to understand and estimate the amount and type of inputs we have to mobilize to sustain the movement. Trained human resources, financial resources, tapping human potential spread across the globe, aligning the young generation towards the movement, institutionalizing the ideology and awakening the masses for the cause all these aspects need to be evaluated not in terms of changing socio-economic situation and the means to deal with. 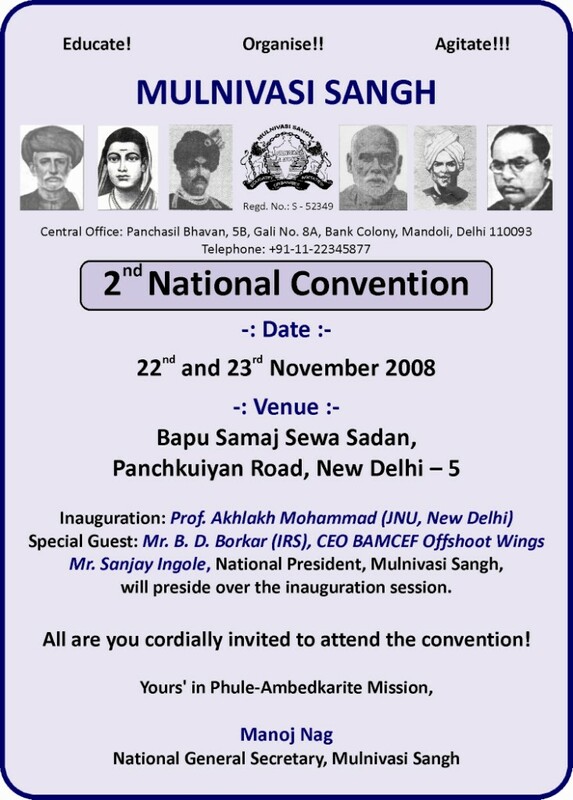 Holding the 25th National Convention is a milestone not only for BAMCEF organisation but is so for Phule-Ambedkarite movement. It indicates the consistency towards our commitment for social change for all this period. It is in this respect this becomes an historical event for Phule-Ambedkarite movement. On such occasion our feeling drives us to identify the place of historical importance in the movement. Nagpur has been the stronghold of Ambedkarite activities. During Babasahebs time Babasaheb himself had given importance to Nagpur for launching his revolutionary move. Nagpur therefore, is dearer to us when we think of laying this milestone. We derive inspiration and strength when the idea of hosting the 25th National Convention comes to our mind. During Babasahebs time Nagpur had witnessed the revolt against Brahminism and the people of Nagpur had supported Babasaheb wholeheartedly, BAMCEF is also fighting againstBrahminism. Fighting against Brahminism is a means for social change. The struggle of BAMCEF is for social change. We need to overthrow Brahminism and bring in social change. Hence we have decided to hold this historic event i.e. 25th National Convention in Nagpur. In this endeavor we appeal to all the people of Mulnivasi Bahujan Samaj to extend all cooperation with time, talent and money and participate in this event to register your presence in laying the mile stone. 5000 years ago the Indus Valley Civilisation was the leading civilization in the world. This civilisation founded by the great aboriginal race ‘Nagas’. The Indus Valley civilisation was flourishing in the areas of Indus River and its 5 dimensions in the entire North-West of India. Out of several civilised cities Mohanjodaaro and Harappa were established at the banks of Indus (Sindhu) River. Consequently this civilisation came to be known in the world as ‘Indus Valley Civilisation’ . The excavationary evidences have now established beyond doubt the this civilization was a symbol of moral values, humanity, equality, fraternity, liberty, prosperity, planning and scientific thoughts. Aryans being an uncivilised, barbarious and nomadic race destroyed the Indus Valley Civilisation and imposed upon Indian aboriginal race, the inequality & hatred based varna system ultimately dividing into 6000 castes to enslave them.After innovations in this history, BAMCEF decided to spread the Mulnivasi culture, among the masses. To achieve this goal BAMCEF has been organizing Mulnivasi Melas since 2005. During ceremonious salutation to our land of Sindhu civilisation, the great ‘Indus River’ by organizing inaugural function at Laddakh on 8th April 2007. The Mulnivasi Bahujan Samaj had forgotten its respectable identity and accepted the caste identity imposed upon them by the Arya Brahmins and started deriving pride in the caste identity. They are ready to fight and even die for the sake of one’s caste and in the process strengthen the caste system ignorantly. Brahmanism is the root cause of all the ills of our society. Mulnivasi Bahujan Samaj fight Brahmanism, in isolation by organizing them as a caste group and are making sporadic efforts without any success. It is essential to make an united efforts to fight Brahmanism. However caste identity is the major obstacle in our salvation. If we want a everlasting solution for our problems, then people belonging to all Mulnivasi castes should unite under a common identity i.e. Mulnivasi Identity and form a separate class to fight for our rights. There has been a history of conflicts between the Arya Brahmins and Mulnivasis from ancient times and our great forefathers used appropriate identities to unite the Mulnivasis. Tathagat Gautam Buddha had united the Mulnivasi people under ‘Bahujan Identity’ discarding the Varna Identity. In Maharashtra, Chatrapathi Shivaji Maharaj had united the Bahujans of Maval territory under the identity of ‘Mavale’, which means the original inhabitants of Maval land. Instead of organizing any single caste, Rashtrapita Jyotirao Phuley had united us under the class of ‘Shudra’ and ‘Atishudra’ while Dr. Baba Saheb Ambedkar had brought in the Mulnivasis, who are disintegrated into different communities, under the ‘socially and educationally backward classes’ comprising of Scheduled Castes, Scheduled Tribes and other Backward Castes and strived to unite us. According to the prevailing times and situations, our great forefathers had strategically used suitable social identities and organized us. However, our enemy has countered the movement of our forefathers using the same identities and therefore those identity does not suit in the present situation to run the movement. Therefore to fight Brahmanism taking cue from our great forefathers, we have to adopt a suitable strategy to forge a common identity and bring unity amongst Mulnivasi Bahujan Samaj. In order to forge unity among different castes, BAMCEF is rejuvenating our original identity, i.e. the ‘Mulnivasi Identity’, which is the common identity that our great forefathers had time and again used for our deliverance. This identity has the potential to remind us of our glorious past and dignified history and would enable us to reestablish our culture and reorganize Mulnivasi Bahujan Samaj. The basis of our Mulnivasi Culture is the principle of equality, liberty, fraternity, justice and generosity. As a result of the invasion of the Arya Brahmins, the Culture of the Mulnivasi Bahujans was infested with their culture of falsehood, injustice, debauchery, deceit, and immorality, which was accredited by the Brahminical Shastras and smritis. Mulnivasi brethren those who had fought against such debased culture were either brutally killed or burnt alive. They have destroyed our cultural evidences, memorials, universities and burnt the libraries and established the Brahminical social system based on graded degradation through Manusmriti. Mulnivasi culture is based on fraternity. Despite disintegration into 6000 castes, the Arya Brahmins could not destroy the culture of Mulnivasi Bahujans. Even today distinct culture of Mulnivasi people can be observed in their life style, dietary habits, languages, dialects and traditions despite disintegration in several castes. Our cultural moorings are expressed in different aspects of social life. Even today, in spite of being separated into distinct castes, the surnames (Kul) and totems of Mulnivasis are similar and distinguishable from the traditions of Arya Brahmins. Our festivals are entirely different from the festivals of Arya Brahmins. The patriarchal culture of the Arya Brahmins relegated an inferior status to women. On the contrary, the original culture of the Mulnivasis is matriarchal which gave honorable place for women. Our forefathers have engraved the philosophical edifice of equality, liberty and justice in our mind to establish fraternity in the society. They are values of life for us. In contrast, the philosophy and way of life of the Arya Brahmins is based on inequality, hatred, contempt and deceit. During medieval period the saints of the Mulnivasi Bahujan Samaj such as Sant Kabir, Guru Nanakdev, Sant Ravidas, Sant Tukaram Maharaj and other teachers supported the cause of Mulnivasi rulers like Chatrapathi Shivaji Maharaj who initiated their battles against Brahmanism and the social system based on inequality. Mulnivasi Bahujans gave him their wholehearted support keeping aside their distinctions of caste. Even during modern period, the people of Mulnivasi Bahujan Samaj extended their united support to the movements led by Rashtrapita Jyothirao Phule, Rajarshi, Chatrapathi Shahuji Maharaj, Periyar E.V. Ramasamy and Baba Saheb Dr. Ambedkar. It became possible only because of their innate philosophical values of fraternity, liberty, equality and justice. It is the unique quality of the Mulnivasis. Being the original inhabitants of this land, the Mulnivasi Bahujans are well convergent to geographical boundaries of our land. The extent of love and affection of the Mulnivasis towards their motherland is immense. The root cause of all problems faced by the Mulnivasis is the caste identity entrusted upon us by the Arya Brahmins and their immoral culture. To counter this, it is necessary to build a strong organization based on Phule-Ambedkar ideology and Mulnivasi identity and unite the Mulnivasi Bahujans as a uniform society under its aegis. It is only through such organization, we could erase the inhuman culture of the Arya Brahmins and reestablish the honorable Mulnivasi culture. BAMCEF has taken up this task and in order to strengthen the Mulnivasi culture special programs are being organized this year on the occasion of birthday celebrations of Rashtrapita Jyothirao Phule and Baba Saheb Dr. Ambedkar. Since 1992, BAMCEF has been spreading the concept of Mulnivasi identity which was used by our forefathers and conducted several programs to make our society understand and realize the importance of Mulnivasi identity. Several seminars and campaigns were organized by BAMCEF till 2006 on Mulnivasi identity on the occasion of Phule-Ambedkar Jayanti celebrations. This year, during Phule-Ambedkar Jayanti celebrations of 2007, BAMCEF has earned a great response. Therefore during 2007 it has planned to organize 500 Mulnivasi Melas & 500 Symposiums in 24 states throughout the country. In these Melas, cultural, literary and social activities, painting, skits and dramas, Kavi-sammelans, elocution and several other exhibitions of Mulnivasi culture will be organized. In addition to the above activities, Mulnivasi cricket tournaments, Mulnivasi indoor sports events, Mulnivasi youth and women conventions and other such activities, which bring awareness among our people about the history of Mulnivasi society will be organized. The success of these activities will lead to re-establish the movement of our forefathers. As you are aware, these activities require adequate financial resources, we request our Mulnivasi Bahujans Brothers to support this nation-wide program contributing financially and participate in thousands to make it the success.